You first saw the "Сisco"? Dear readers, we now with you let's fantasize a bit and imagine a very interesting situation. You are a specialist who specializes on service computing, server configuration, or you are a novice NOC who has never seen before "Cisco Systems" equipment (further we will use the name "Cisco"). Assume that one day your boss decided to purchase the equipment to upgrade or deploy a network infrastructure. And here before you is a brand new switch, router, or other network device from Cisco. What to do with it? How to configure such equipment? A number of other questions at this moment may occur in your head (At least, I have similar issues prevailed at the first acquaintance with switches from Cisco). This post is targeted specifically at those professionals who are first confronted with equipment from Cisco. I will discuss the main aspects of the first experience with equipment from Cisco that runs under the operating system "Cisco IOS" (Internetwork Operating System). 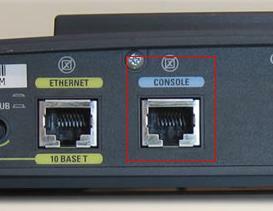 Examples of such equipment are the routers: Cisco 1841, Cisco 2811 and similar models, switches Catalyst 2960, and most of the equipment produced by the company "Cisco". Where should you begin setting up newly acquired equipment "Cisco"? To start you'll need to connect the hardware to the computer from which you will be configuring it. For this purpose, you can use a special console cable that comes with your purchased equipment (In some cases the cable may have to be purchased separately). The appearance of this cable is shown in figure. In case you have no console cable or there is no possibility to buy it, you can make it yourself. This will require: network connector (RJ-45 8P8C), few meters network 8 wire network cable, plug - "female" to connect to the COM port (cable plug), a crimper and a soldering iron. The figure shows how it should be crimped onto one end of a network cable. In accordance with the same drawing, the second end of the cable needs to be soldered on the plug. The pin assigments of the console cable "Cisco"
You will have made a console cable for connection to network equipment of "Cisco". It should be noted that setting up the hardware company Cisco recommends the use of genuine console cables. 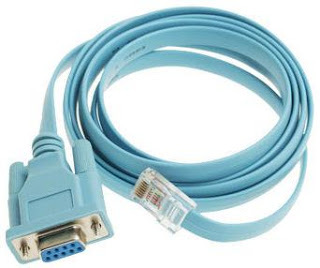 To connect custom hardware to the computer one end of the console cable (which is equipped with a network connector RJ-45 8P8C) plugs into the console port of the network equipment (usually has an inscription with the trim in blue - CONSOLE), the other end of the cable connects to the COM port of your computer. 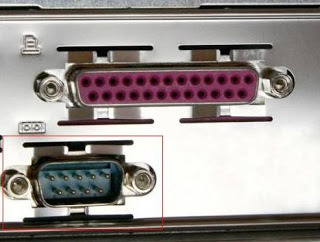 Appearance of the console port "Cisco"
Connect to computer custom equipment company "Cisco" and make it the setting with the help of special software you will be able after connecting the cable. As such software you can use HyperTerminal, PuTTY and other. Unfortunately, HyperTerminal is not standard pre-installed application, starting with Windows 7 (Possibly Vista, I don't have accurate information), therefore when installing it you may encounter difficulties. In this case, the best option would be to use PuTTY.This ssh-client you can find using Google. Its installation and start-up will not cause any difficulties. PuTTY is using telnet, ssh or through the serial port allows you to connect custom hardware. We are interested in the last option. To do this in the section "Connection Type", select "Serial" in the field "Serial Line" you must specify the COM port number to which the device is connected (for the first port specify COM1, the second port - COM2 and so on). The value of the field "Speed" should be left unchanged as 9600. After you set all the parameters according to the above description, you must click on the button "Open", which opens a console window. The screen will be completely black and will not respond when pressing keys on the keyboard. Run a Cisco device. On the console screen will display information about the device characteristics and the course of the run. The figure shows the approximate form of the console at the time of starting the device. You should wait for the process start-up. On the screen appears: "Press RETURN to get started!". Press "Enter". The input pointer will move to a new position and the console will display "Router>" (this example corresponds to the configuration of the router, so when configuring another type of device, the words "Router" will be replaced by another in accordance with the type of device). You are now connected to this unit and can hold its setting. Setting up the hardware "Cisco", you must know that manufacturer provides 3 types of accesses to the device (there are 15 levels of access privileges, but at the moment we will not delve into this topic). The first mode: unprivileged (EXEC). You get into this mode immediately after connection to the equipment. In this mode, you cannot change the device configuration, but you can see some of his characteristics. On the console being in this mode is indicated by ">". For example, in this mode, you can run the command "show history", which will bring the list of commands executed during the same session (This command displays the executed commands and all that were made to the console. even any meaningless rubbish will be displayed and all entered a meaningless team, but a real and proper team "show history"). The result when you type the command "show history"
The second mode: privileged (privilege EXEC). This mode will allow the user to view information about the device, its configuration and save the current configuration, without the possibility of any change. In this mode you can move from user mode by typing "enable".From the console, this mode is denoted by "#". For example, in this mode, you can enter the command "show running-config", which is the current working configuration of the device. The third mode: configuration mode. In this mode, you will not be able to view information about the device and its configuration, but will be able to make changes. To enter configuration mode, type the command "config terminal" in privileged mode. From the console, this mode is indicated by "(config)#". Now back to the practical part. After you have connected the equipment you will be in unprivileged mode. You must enter the command "enable" to enter the privileged mode. To view the commands available in this mode, you should enter a "?". The screen displays all available commands. Type this command and for information about any of these commands and available parameters, type a question mark, for example: "show ?". Obtaining help for commands "Cisco"
It should be noted that when the set of commands turn on auto-completion, that is: if you typed the first few characters of the command, and they will not be repeated in the other command and you will only need to click on the "Tab" key and your command will be automatically added. Also you can use lightweight variation of the command. For example, you can use the command "sh" instead of "show", because these first two characters are not found in early names of the other commands. That's all I wanted to tell you at this point in time. In the following articles we will look closer at the process of configuration of various network devices Cisco and consider the purpose of many commands that you saw when entering the command "show". Read this post in Russian / Читать эту статью на русском языке. This blog covers the topic of network technologies. Here you do not find boring theory. Show examples to explain complex things in simple terms.